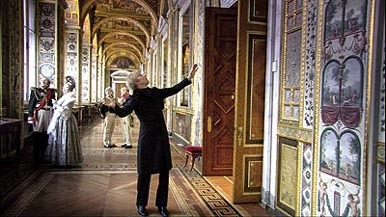 The Russian Ark by renown Russian director Alexander Sokurov was produced in 2002, but I've seen it just a few days ago. 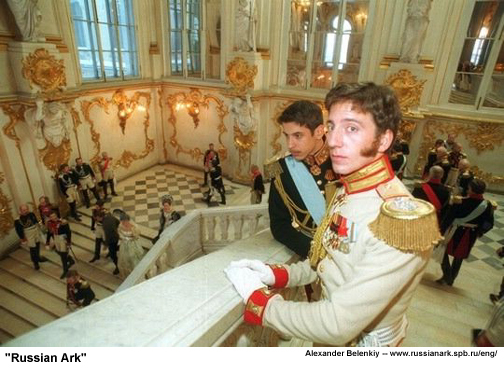 The whole film is staged in the Hermitage and shows its great halls and arts treasures in their full grandeur. There is no story as such, just a series of scenes: a great court ball, a reception of Persian prince by Nicolas I, a family tea-party of Nicolas II, and more. The costumes are splendid, although not always historically precise (e.g., the dancing officers wear their parade uniforms - instead of special ball uniforms, other cavaliers brandish long trousers - instead of culottes, and so forth). Minor faults actually. Even on me, intimately acquainted with the Hermitage and other parts of the Winter Palace complex, this Russian-German co-production has made a formidable impression. Dear Mike,I agree with you! The Russia Ark is not an historical movie.In my opinion,it's like the Hermitage's memories,like a dream...Yes, there are minors faults,in particular in the final scene,but I think it's a "mixture" of all the eras with theirs heroes,historical personnalities. This is a very fanciful movie,an art work and not a documentary movie! Have just watched RA for the third time. Found it helpful to watch the "making of" section first, as there were a few scenes that required explanation. I really enjoyed it's dream like quality, the voice of Sokurov off camera, and OTMA running through the hall. All and all a feast for the eyes, and imagination. "Simply the thing I am shall make me live"
I rented Russian Ark from the library a couple of weeks ago. I thought the film was fabulous! I found myself watching it every single day, sometimes twice a day, over the course of a week. It seems like certain films can help me concentrate better on something. If I had Russian Ark on while I was doing homework or something, I would be able to do it faster. Odd isn't it? I just really loved everything about the film, and I adore the Russian language. It really was a treat! I recommend it to anyone interested in Russian history. Well, that's pretty much everyone on this board! I have watched Russain Ark - it was in English subtitles. I watched it the first time to read the subtitles because I had to know what they were saying! But then I watched it without reading - it is as wonderful as being there - I walked in their footsteps through each room reliving my footsteps. It was a camcorder that I did not have during my own visit. I love that old man. BTW, that old man is Marquis Astolphe de Custine who visited Russia in 1839 and whose resultng Letters were vehemently denounced by all Russian rulers from Nicolas I till Andropov. A must reading for everyone interested in Russia and its history. Great pictures and it was a pretty good movie. I enjoyed seeing the Hermitage and it's treasures. I found the last scenes very gripping.